Proof, if it were needed, that using VST Connect Pro makes you smile. Steinberg has released version 3 of its VST Connect Pro plugin, which enables Cubase Pro 8, Nuendo 6.5 and Cubase 7.5 users to collaborate with each other online. As before, multitrack recordings can be streamed directly between the DAWs, but VST Connect Pro 3 promises a new and more intuitive design and single-click setup. 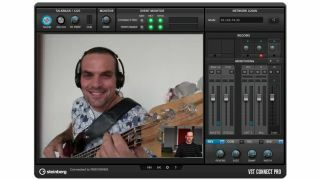 The video window can now be detached from the main UI, and FX inserts have been added to VST Connect Performer, the Mac, PC and iPad app that enables non-Steinberg users to collaborate with Cubase and Nuendo owners. Files can now be exchanged between VST Connect Pro and VST Connect Performer, too. "VST Connect Pro 3 is the result of developments toward a more inclusive approach, giving us more flexibility in usability and presenting the user with more versatility," said Matthias Quellmann, product marketing manager at Steinberg. VST Connect Pro 3 is available now from the Steinberg website priced at €199, though it'll be on sale for the introductory price of €149 for the next four weeks. Existing users can upgrade for free.